Santa Monica, CA and Beijing, China – April 23, 2018 – Skydance Media, LLC (“Skydance”), a diversified media company that creates event-level entertainment for global audiences across multiple platforms, and Tencent Pictures, the film and television arm of Chinese internet giant Tencent Holdings Limited (“Tencent”), announced today that Tencent will co-finance as a global partner the upcoming Terminator film directed by Tim Miller and produced by James Cameron and David Ellison. Under the pact, Tencent will also handle the distribution, marketing and merchandising of the film in China. This is the first collaboration between the two companies since they entered into a partnership, with Tencent making a strategic investment in Skydance Media. “We are truly excited to be partnering with Skydance on the newest chapter of this iconic franchise. 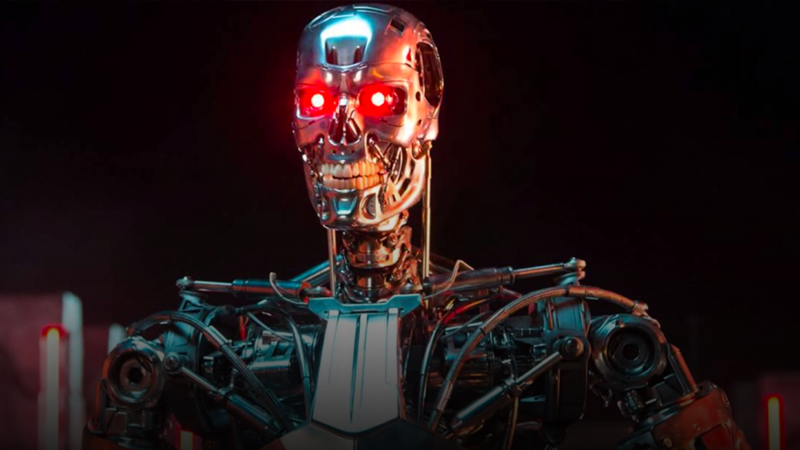 With Skydance’s savvy production expertise and impeccable taste in talent, along with Tencent’s tremendous marketing and distribution capabilities in China, we believe the success of Terminator will serve as a benchmark for future collaborations,” said Edward Cheng, Vice President of Tencent and CEO of Tencent Pictures. The upcoming Terminator movie will be a direct sequel to Cameron’s Terminator 2: Judgment Day starring Arnold Schwarzenegger and Linda Hamilton, both reprising their iconic roles as “The Terminator” and “Sarah Connor” from the first two Terminator films. The new story will introduce the next generation of characters played by rising stars Mackenzie Davis (Blade Runner 2049, “Halt and Catch Fire”), Natalia Reyes (“Lady, La Vendedora de Rosas”), Diego Boneta (“Scream Queens,” Rock of Ages), and Gabriel Luna (“Marvel’s Agents of S.H.I.E.L.D.”) Specific details on the characters are being kept under wraps. Paramount Pictures and 20th Century Fox are also co-financing the film which is scheduled for U.S. release the Friday before Thanksgiving on November 22, 2019. The movie will be distributed domestically by Paramount Pictures and internationally (excluding China) by 20th Century Fox. Skydance is a diversified media company founded by David Ellison in 2010 to create high quality, event-level entertainment for global audiences across platforms, including feature films, animation, television, gaming and digital. To date, Skydance has produced and financed 15 feature films, which have cumulatively grossed nearly $5 billion in worldwide box office. Skydance TV launched in 2013, creating 8 premium series to date, with current distribution partners that include Apple, Amazon, AMC, DirecTV, Hulu, Netflix, and The Paramount Network. Skydance Interactive is a multifaceted game studio with premier brand games, including Archangel VR. In the last four years, the Company has grown from 15 employees in Santa Monica to over 150, with facilities in Santa Monica, Marina Del Rey, Hollywood and Vancouver. Tencent uses technology to enrich the lives of Internet users. Tencent’s social products WeChat and QQ link its users to a rich digital content catalogue including games, video, music and books. Its proprietary targeting technology helps advertisers reach out to hundreds of millions of consumers in China. Tencent’s infrastructure services including payment, security, cloud and artificial intelligence create differentiated offerings and support its partners’ business growth. Tencent invests heavily in people and innovation, enabling the company to evolve with the Internet. Tencent Pictures, the film and television arm of Chinese internet giant Tencent Holdings Limited (“Tencent”), has been a key strategic partner on a number of high profile global films such as Universal’s Warcraft, Warner Bros’ Kong: Skull Island, and most recently Warner Bros’ Wonder Woman.